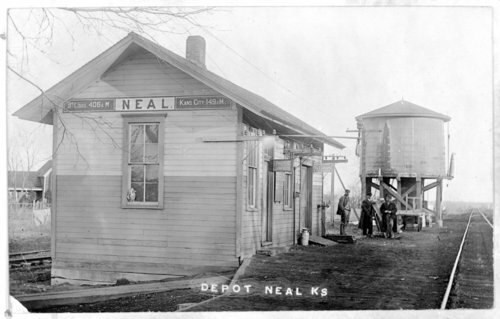 This photograph shows the Missouri Pacific Railroad depot in Neal Kansas. The distances between Neal and St. Louis, Missouri (406 miles) and between Neal and Kansas City, Kansas (149 miles) are listed on the outside of the building. In the background three men are standing in front of a water tower.